Even if you clean your carpets on a regular basis, stains and tracked-in dirt can be a problem. 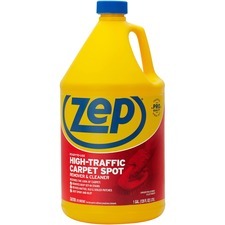 This Commercial High-Traffic Carpet Cleaner is formulated to remove stains and clean high-use areas before or between shampooing. Natural enzyme action removes odors. Large quantity allows multiple refills for your trigger spray container (sold separately).